Caprice Photography is the professional's photographer. 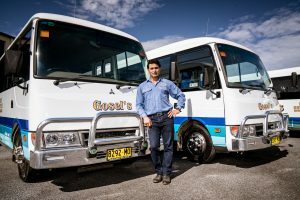 Photographing your function, promotion, website images or corporate head shots, Caprice Photography will do it all! 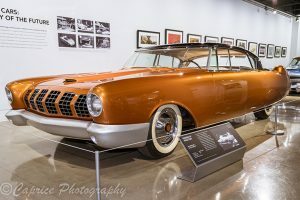 The family station wagon has always been exemplified as the people movers but now the modified car scene, and in particular, classic car aficionados are finding the long roof vehicles to be a cool car for the latest modifications! They retain the original flash trim mouldings and styling of the sixties classics but install late model running gear underneath for better drivability on today’s roads. 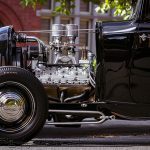 Combining my love of cars and film, I bring you this brief interlude as part of our Greased n Gassed YouTube channel series on our automotive scene! This classic 1964 EH Holden sedan retains its original guise while a late model LS1 V8 is the heart beat under the bonnet! Attention to detail has seen this fine example of a street machine rise to the top of its class thanks to the owner’s fastidious attention to detail when it comes to fitment of non original parts and cleanliness. This short video we shot of the red rocket captures the essence of the four door beauty in all its glory! Art Deco photography and a 1932 coupe! 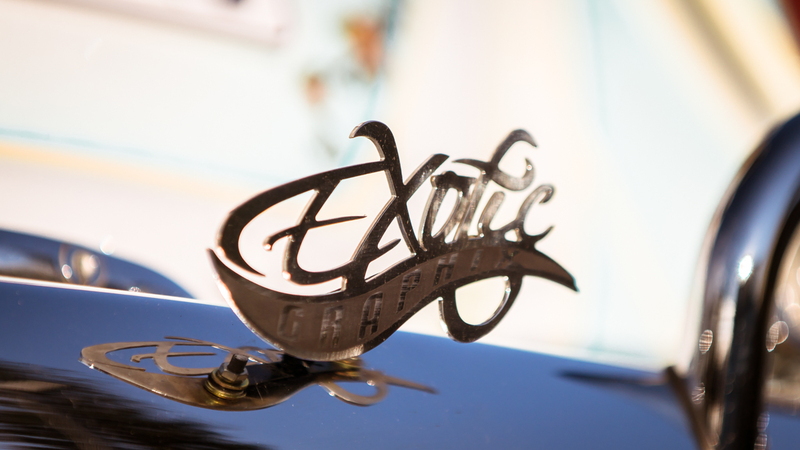 Award winning automotive photography delivers award winning results for Exotic Graphix! 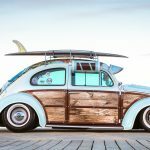 As a professional photographer specialising in automotive photography, we were commissioned by Exotic Graphix to photograph their creatively vinyl wrapped Volkswagen Beetle. The images from this photography shoot would be sent to the judges as representation of their entry into the Avery Dennison Wrap Like A King global competition so nothing less than award winning automotive photography would be good enough! I took the challenging shoot on with enthusiasm as we set about choosing a suitable location, time of day and lighting execution for a fantastic shoot! How do you top your own global award winning competition car from the previous year while still maintaining the sanity of your team? Do what Nick from Exotic Graphix has done and think outside the square! After winning the top prize in 2016 of the global Avery Dennison Wrap Like A King competition, it was going to be a tough ask to attempt back to back wins without going over the top and damaging both business as well as employee relationships! Nick’s the sort of guy who thinks beyond the boundaries of what’s already been done and prefers to be a thought leader in the field of custom vinyl wraps. His creative thinking and can-do attitude allows him to progress ideas into reality by believing anything can be done, we just need to work out how! Surrounding himself with a positive group of like-minded people gives him the advantage of bouncing ideas around till they come up with a solution! Nick explains where the seed was planted for this year’s Wrap Like A King entry came from. 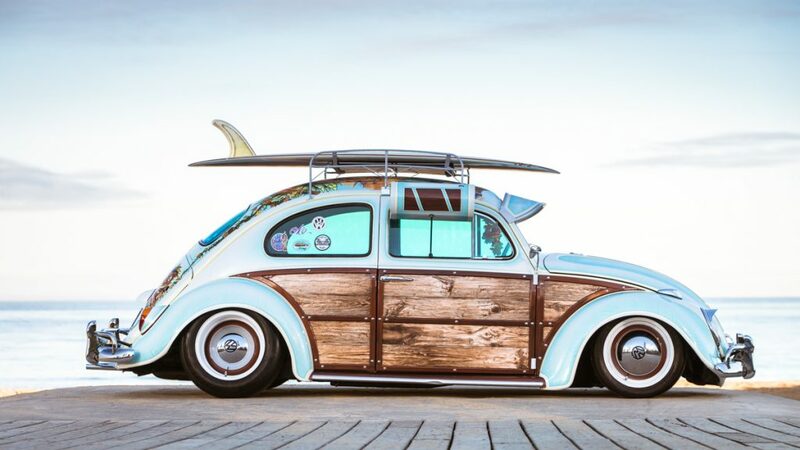 “We started with the wood idea as we had the idea of how to create 3D wood from vinyl wrap. 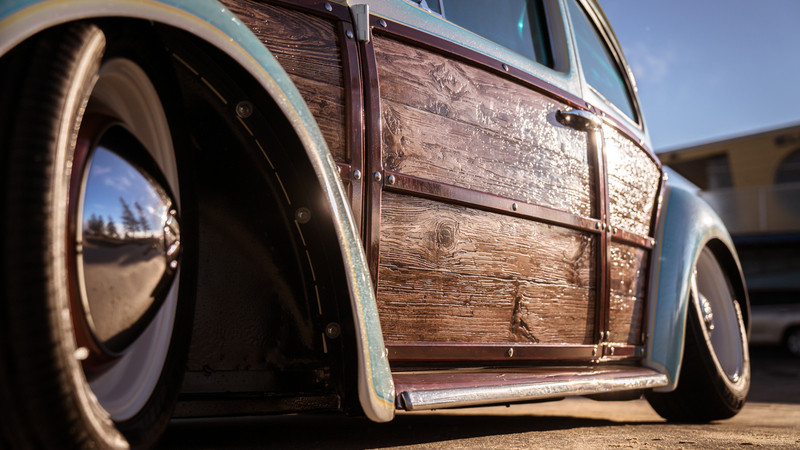 Initially we were thinking C10 pick-ups with a wood bed but we wanted the wood to be more of a feature. So then we decided to do a woodie and I tried to get hold of a Spinner wagon. We managed to get hold of one car that was available but the car was in fairly rough condition plus we wouldn’t own the car but just use it. I thought, if we’re going to invest this much time into a car, let’s do one we own. 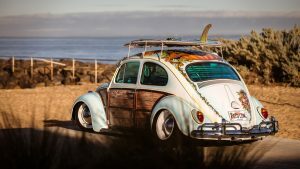 With a fondness for old school rides, Nick had thoughts of purchasing an early oval window Beetle for the build but these early era bugs are highly sort after and are priced accordingly. 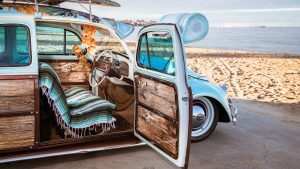 Instead, he settled for a 2 owner 1963 Beetle located in Stratford that he sourced from Gumtree. The car was a good clean example and even retained the original log books thanks to the two fastidious owners! 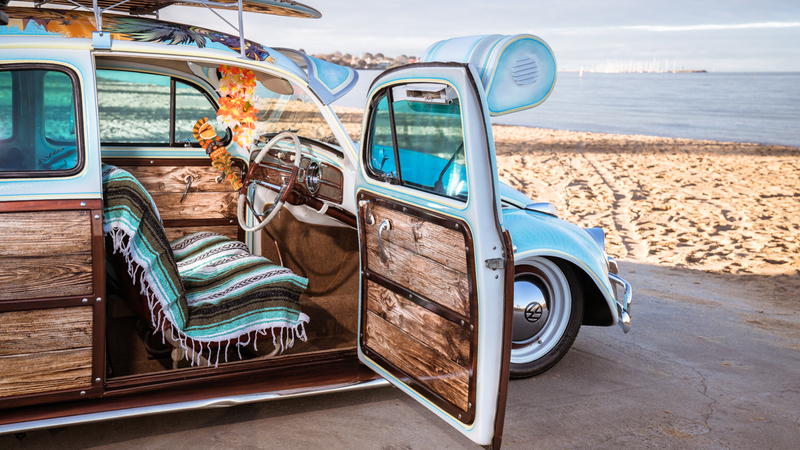 “The owner had no idea what we were going to do to his Beetle and I still haven’t sent him a photo of how it looks now. He’ll freak out when I do! He’ll wonder what we’ve done to his car!” laughs Nick! 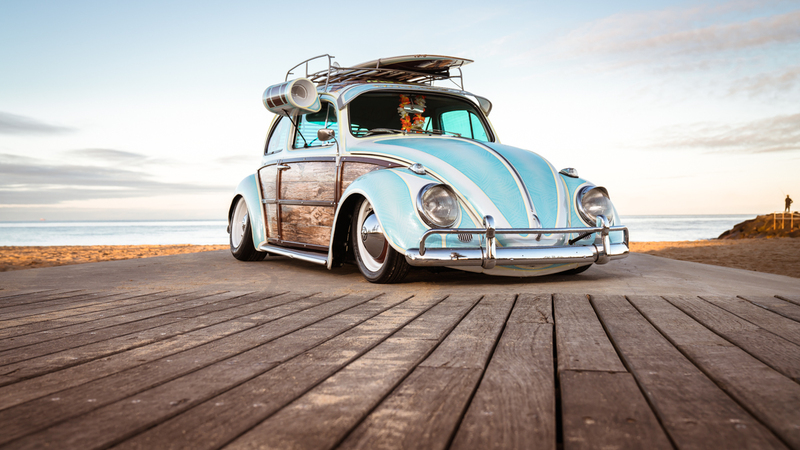 To look at the amount of detail that has gone into this Type 1 Volkswagen, you’d be excused for believing that it’s been a long term project when in fact it all came together in an action packed seven weeks! “From the day we brought it to the day we entered into the competition, it was seven weeks! There was six weeks of actual working time on it. The first week was spent just nutting the build out!” explains Nick! 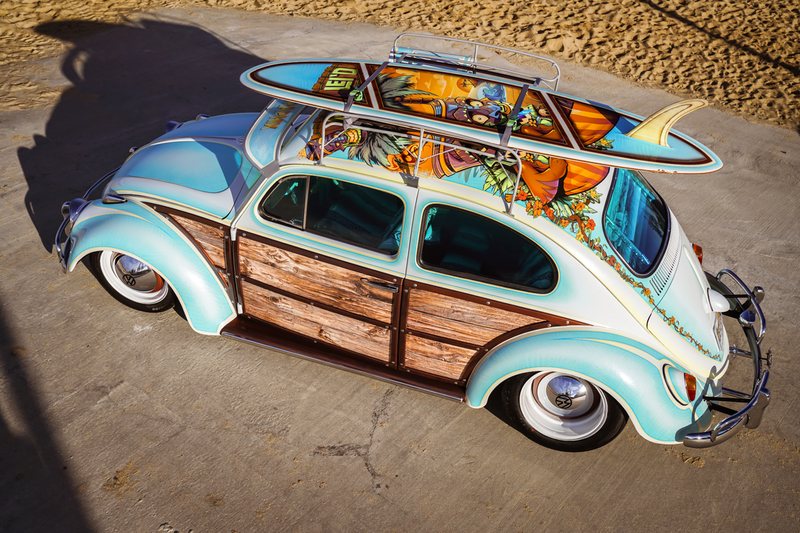 A classic set of roof racks created ambient space for all sorts of accessories from a set of old travel cases strapped down one side while the obligatory sixties style, single fin long board had to been seen long and loud atop the oval roof! “I used to do work for Oke Surfboards when I was an apprentice so I called in a favour and they made us up a right era, single fin longboard to our measurements for the car. After we wrapped the board, I took it over to them and they flipped out with the design and finish because we 2 pak cleared it for a smooth finish. He also couldn’t remember doing a plywood fin on the board until I pointed out that we wrapped it in a plywood printed vinyl.” It’s opened up a new train of thought for surfboard art now too! 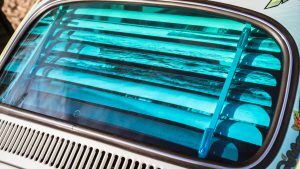 Another huge talking point on the car is the swamp cooler! While many of us have spent time around the classics to know what and how they work, for the average person on the street, this early era car cooler is a curiosity with Nick finding himself explaining on a regular basis the basics of it. Purchasing the evaporative cooler from a super nice guy he knew from Las Vegas, Nick assures me this aftermarket add on works well but just won’t shut off due to its design! 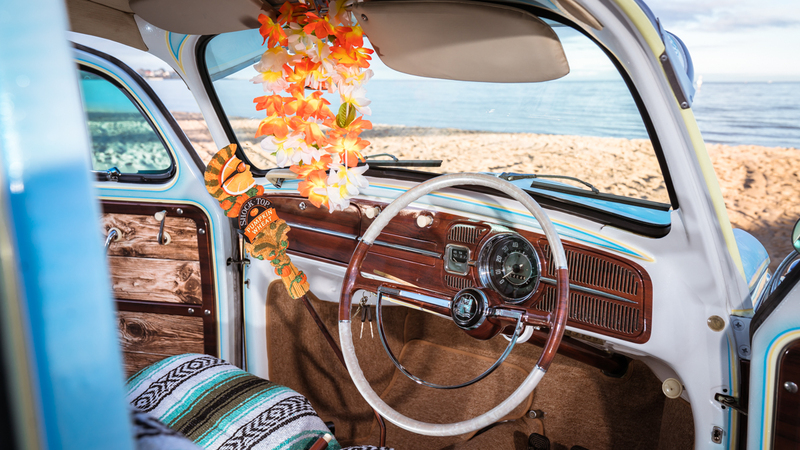 “It’s freezing cold and you can’t turn it off due to the design so when you’re cruising at night, it blows cold air in on you! There’s flaps to close but they just leak out! I might get Dad to fab up a cover for the vents or something.” chuckles Nick. 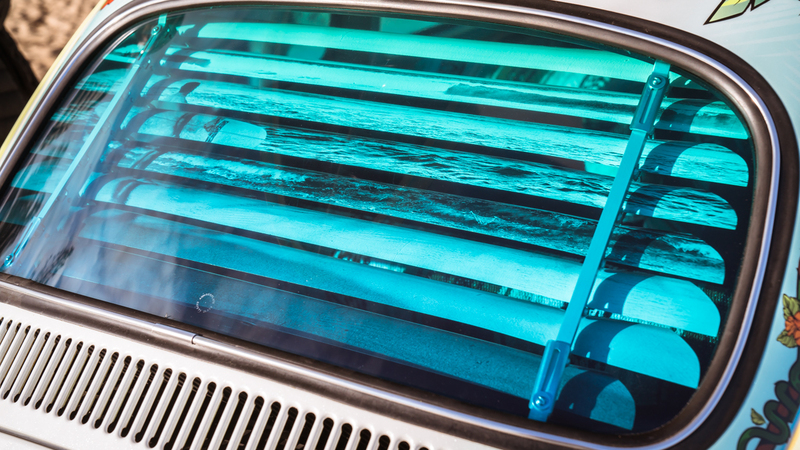 Nick lives and breathes vinyl wrap so when he could purchase the classic green glass for the type 1 Beetle, he just printed a transparent greeny blue vinyl and did his own tint! Works a treat too. A venetian blind for the rear window? Let’s wrap that too! 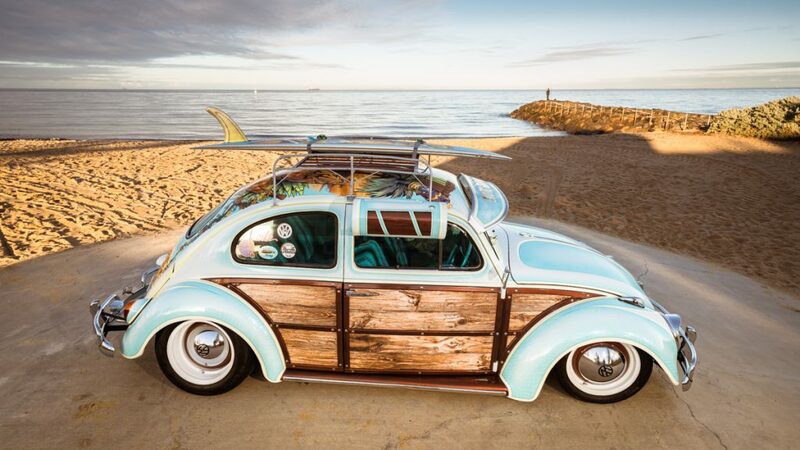 And not just with a timber effect finish which one initially thinks but on closer inspection, it’s a beach themed image running down the slats! 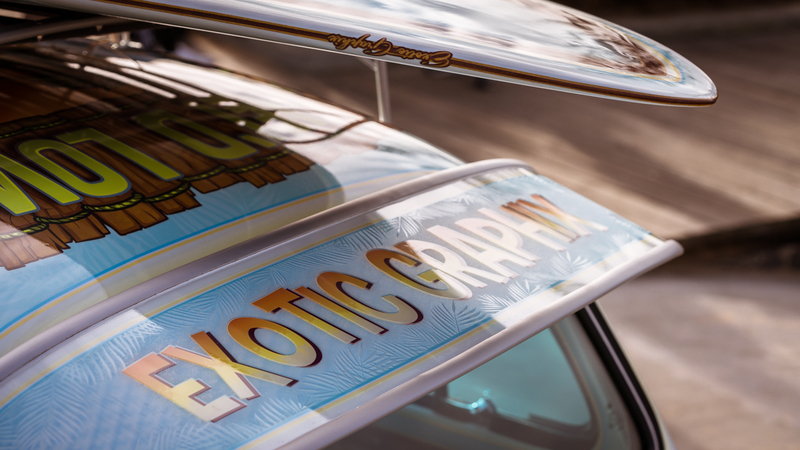 So much of this car is wrapped up in detail! That Lie’d Low stance is achieved from a suspension and front end kit sourced from Fresh Kustoms. Tin God Solutions helped out with the wheel and tyre package after working out straight up what stance Nick was chasing! 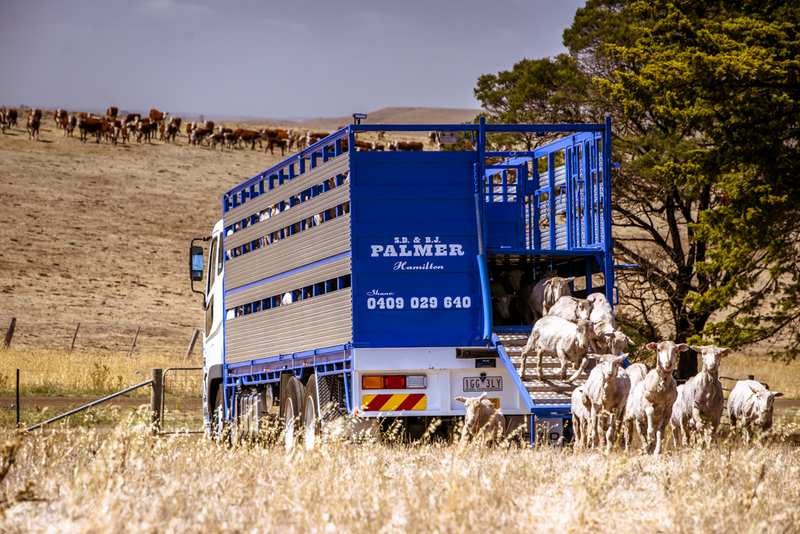 Nick sent through a few photos of the style he was after and a set of 8 X 15 rears with the correct offset were sent out while the original cheese cutters remain on the front. To save any rubbing issues, a narrowed four inch front beam replaced the wider track unit before Nick’s dad and Ben from Black Mamba bolted it all into place. Nick tossed up different colour choices for the rims before, well, you guessed it, he decided to wrap them with a timber finish! “We always try and stick to a theme all the way through. 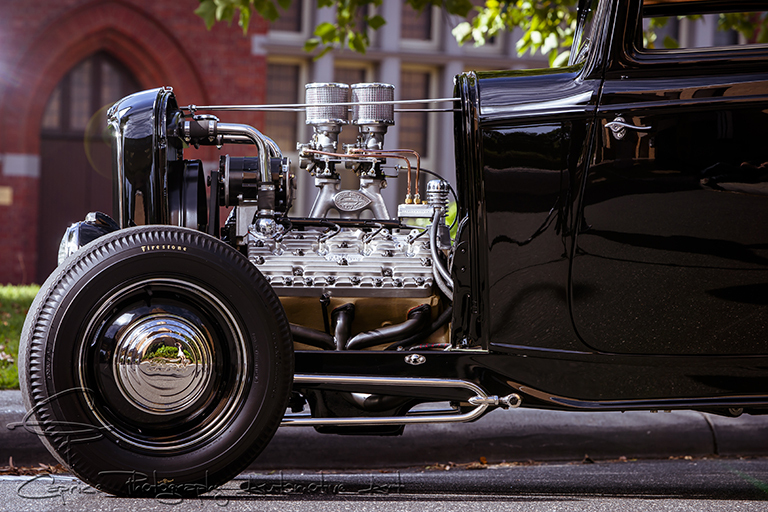 We did it with the hot rod and have done it with Lie’d Low too. We steered clear of anything that wasn’t in the sixties era. This included various custom vinyl wraps that were available.” And after 600 hrs and 11 team members plus subbies, I think you’ve nailed it! But that 11 team members couldn’t do it without their partners! Nick’s wife Ashlee has been so supportive of the project and for the amount of time Nick and his team have had to put into it, with many long days and late nights as have many of the other partners of the builders. With two young children to look after, Ashlee has taken care of all this side of life giving Nick the many hours required to create such a detailed project. As thanks for her patience, Nick is taking Ashlee to SEMA with the crew this year to see if they can win again. The children will be being spoilt by their grandparents! Everyone wins! And as for next year’s competition entry? “We’ve got ideas for next year’s competition but no plans at this point. I’ll only enter the competition if I know we can do better than what we competed with the previous year.” We wait with anticipation! I discovered this gem of a concept car located in the revamped Petersen Museum on a recent trip to the United States! What should you look for when hiring a professional photographer? Does your hired photographer ask you details about the photography shoot before firing off the camera? Hiring a professional photographer means hiring a photographer with experience. Do they ask what the images are to be used for before your event, commercial shoot or portrait session? If not, how are they going to photograph and deliver to you or your media manager the images that you require? One of the first questions you should be asked when hiring a professional photographer is “are the photos to be used for digital purposes or for printing purposes?” Both of these mediums require a different style of photography incorporating varied composure of the subject and surrounds. Print, for example, might be for brochures or flyers requiring a certain amount of negative space in the image for you or your media manager to utilise with headings and advertising information. What about the format of the print media? Is it a magazine, poster or lay-flat flyer? Is the magazine a traditional portrait style, coffee-shop popular landscape style or more of a square format? These are critical questions the photographer should be asking when shooting a cover shoot! It can save you and your staff many frustrating hours of trying to fit a square peg into a round hole, so to speak. If they are to be used for digital purposes such as website images or on the many social media platforms, there are different styles to take into consideration here too. Website images need to work in with the parameters of your site, from the hero shot for your header page through to the preferred portrait style “about me” portrait image. The design of the website gallery might require an artist square format or maybe your own creative flare might like to utilise a more artistic mosaic style when highlighting the various appointments of the company’s business and assets. Most header images are much wider than their height and, when this is taken into consideration before the execution of the shot, can create eye catching results which, as you would know, can be very beneficial to the time a potential customer can spend on your business website. Today’s generation spend up to nine hours on social media! Hiring a professional photographer will ensure they pause long enough to take in your eye catching images! When it comes to the fast pace world of social media, each platform has its own preferred way of displaying your images from Pinterest’s one image at a time to Slide-Shares’ multiple images stacked in a slide format. Facebook albums work well to tell an overall story using numerous images, generally no more than ten to fifteen is seen as the preference when it comes to sustaining the viewer’s attention. Would one of those album images tell the story on its own or do you prefer to post single images at a time and therefore it’s important the photographer takes images that can accomplish the message you are wanting to pass onto your audience. Captivated by the print media images perhaps? Great results will do this when hiring a professional photographer. Pinterest images are displayed in columns so the portrait format works best on this platform by displaying five times larger than its landscape format counterpart. 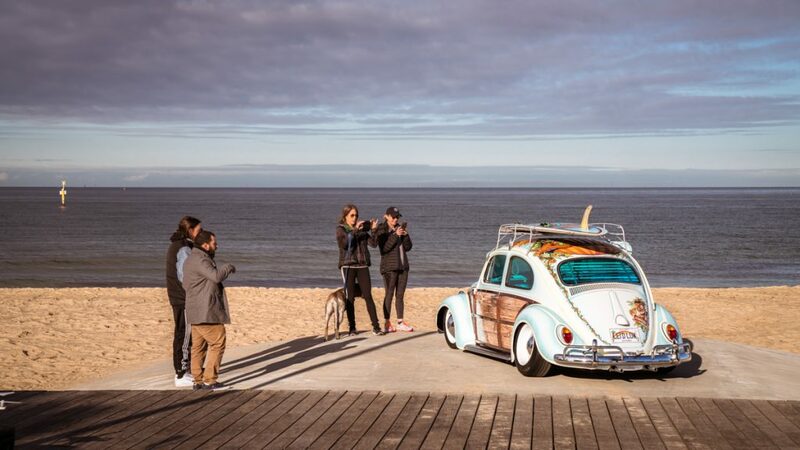 Instagram images are square and, if not taken into consideration when photographing your event, premise or product, can crop out important parts of a great photo leaving the viewer wondering what they are looking at? What about sizing and watermarks for the various social platforms, does your photographer know about each of these and can send you a file with your images already formatted and ready to go for your convenience? Even after the shoot is completed, there are numerous decisions to be taken into consideration before sending you the final file or files of images. Do they know and understand what’s required for images used for printing purposes such as the correct dpi, colour specification and overall image size? Sure, they can send you the images as big as they come but it creates unnecessary down time as you or your media manager mess around with time consuming uploads if the images are not needed to be so large. The right shutter speed and aperture captures motion and lighting in a split second! This is what you should expect when hiring a professional photographer. These are all questions to be asked by a professional photographer in today’s’ multi-media advertising landscape and can save you and your staff many hours which are better spent in other more important aspects of the business so does your photographer know what they are shooting for? Do you have questions you’d like a professional photographer to ask you before starting a shoot? How do you prefer to have your files delivered? Tell me your thoughts on my Facebook page! Stay in touch and receive monthly emails like this by signing up to my mailing list. 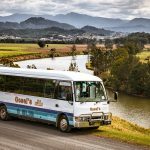 Nothing heavy, no sales pitches, just good images and info! Getting all choked up? Using pictures in social media marketing will alleviate the strain! 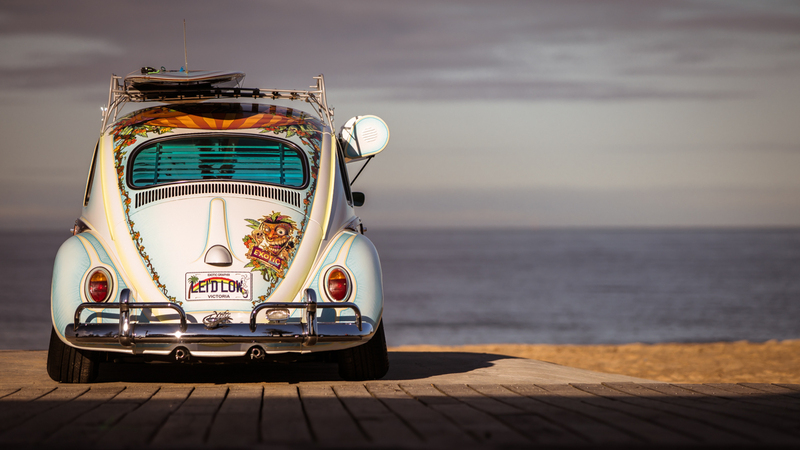 Using pictures in social media marketing for your campaigns. Do you feel strangled with your social media marketing?